This special recipe has added methionine to help acidify the urine for optimum urinary health, along with carefully selected fibre to reduce calorie content, and carnitine to aid metabolism and avoid weight gain whilst promoting lean muscle maintenance. 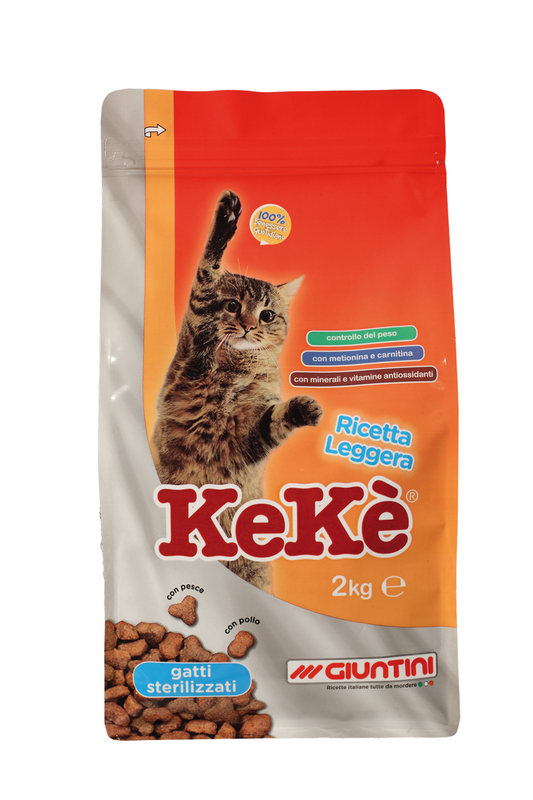 Kekè Light Recipe supplies nutrients of high biological value, and is highly digestible. The tasty kibbles, with chicken and fish, are crunchy, crumbly and easy to chew, with top palatability. This diet is also recommended for more senior cats, due to the high content of antioxidant elements, minerals (zinc), vitamin E and Vitamin C.
Can be served dry, straight from the pack. Always allow access to clean, fresh water. Calculate the recommended daily intake for your cat, it is fast and easy. Cereals, Meat and animal derivatives (chicken min. 10%), Vegetable protein extracts, seeds (Whole soya beans min. 2%, Whole linseed min. 1%), vegetables, Derivatives of vegetable origin (cellulose fiber pure min. 0,5%), Fish and fish derivatives (min. 4%), oils and fats, minerals. Crude protein: 33,0%; Crude oils and fats: 9,0%; Crude fibres: 3,5%; Crude ash: 8,0%; Methionine: 0,8%; Calcium: 1,4%; Phosphorus: 1,0%; Sodium: 0,3%. Vitamin A: 20.000 U.I./kg; Vitamin D3: 1.000 U.I./kg; Vitamin C: 70 mg/kg; Vitamin E: 130 mg/kg; E2 Iodine: 0,7 mg/kg; E6 Zinc: 16,8 mg/kg; Carnitine: 70 mg/kg. 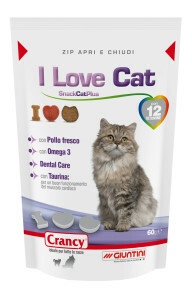 I Love Cat is a tasty snack with fresh meat, and contains 12 supplementary vitamins, a carefully selected insoluble fibre source which helps maintain clean teeth, and taurine to aid optimal cardiac muscle function. 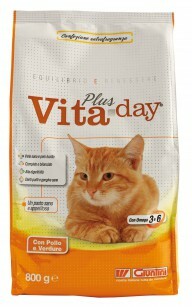 VitaDay Plus is a tasty complete food for cats with the correct balance of all the nutritional elements that are indispensable for the balanced growth and maintenance of your cat.